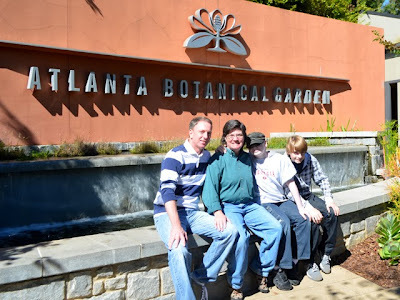 Last weekend I went with one of my dearest friends and her boys to the Atlanta Botanical Garden to see Scarecrows in the Garden and Imaginary Worlds: Plants Larger Than Life...we had a fantastic time! See all of our photos in a video at the end of this post. 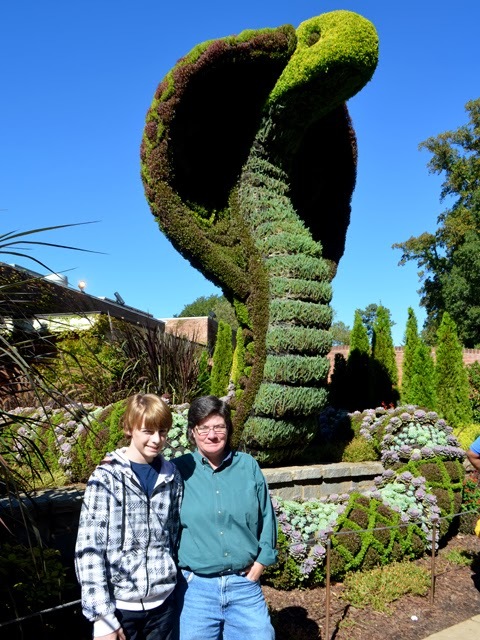 Mary Jo had not been to the Garden in a number of years, Zach had been once but didn't remember a lot, and it was Kam's first time...we were all in for a treat with TWO exhibitions going on! 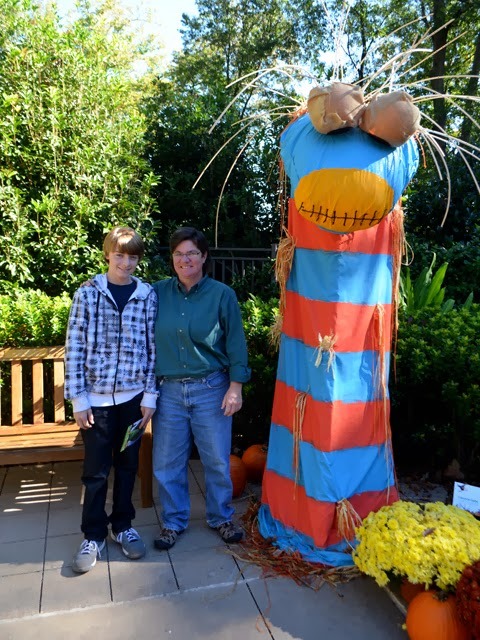 The Garden is filled with scarecrows, which you start seeing (and making photos with) immediately upon entering. 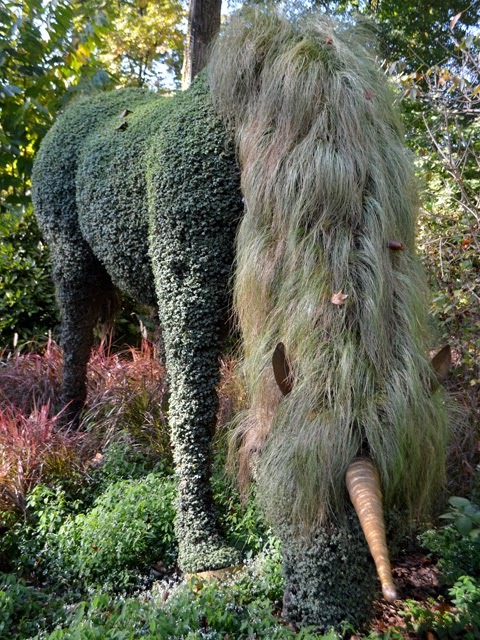 Same with the Imaginary Worlds living sculptures--there are 19 of them throughout the Garden, whereas the 131 scarecrows are scattered throughout the Southern Seasons Garden and the two-acre Children's Garden. I do believe this is a record year for Scarecrows in the Garden, and I heard a number of visitors say it was "the best year ever." It was fun having the boys along because they "got" the scarecrows that were based on cartoons and gaming icons. 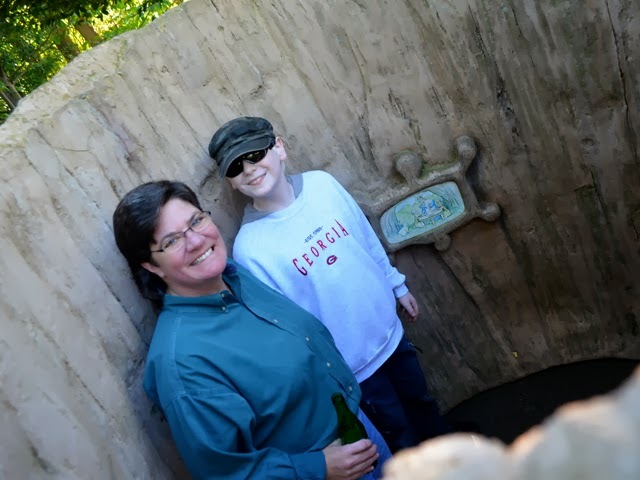 Zach, pictured above with Mary Jo, had a birthday a few days after our excursion. "Happy birthday, Zach!" 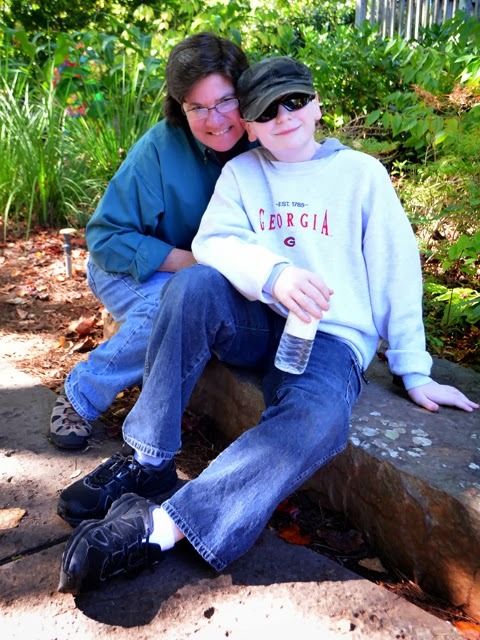 Mary Jo and I have been dearest friends since 1987, having met when we both worked for Equifax. That seems like several lifetimes ago! So, I've known the boys since they were born. But I lived in Washington, D.C. during most of their formative years, but I got to watch them grow up via Facebook. 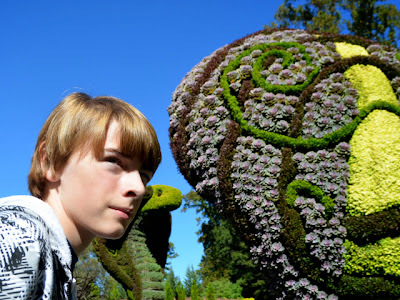 Kam was being a little camera-shay at first, but got over that before we got too far into the Garden...got some great photos of him and I love the one above of him and MJ. I'm not a father and my nieces and nephews live in another state--and they all have kids of their own now!--so it's a real treat to get to hang out with these guys. After the Garden we went to Grindhouse Burgers for lunch and then we went to Midtown Bowl for a couple of games. It was a full afternoon! 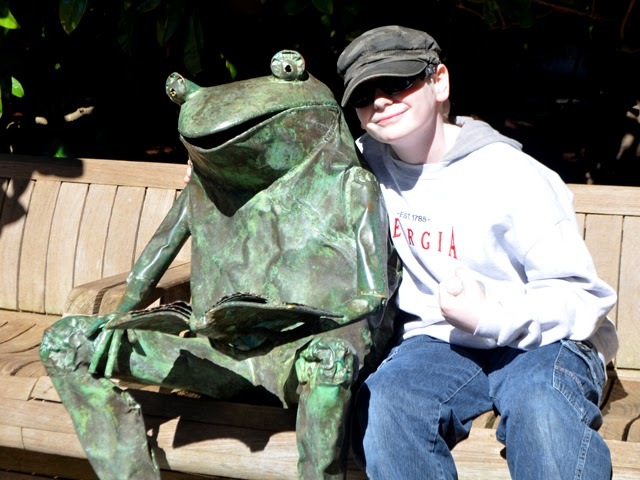 The guys really liked the statue frogs and LOVED the frogs in the Fuqua Conservatory. We'd originally planned on visiting the day before, Saturday, but I had to work longer than expected, but it work out because the weather was so much better when we did go. We'll have to go back so they can see the Saturday, 11:00 a.m. Frog Feeding...when ALL the frogs come out! They enjoyed the other animals...the turtles, including the Dragon Snapping Turtle in the Conservatory, the salamanders, the quail, and of course all the real and mythical Imaginary Worlds and scarecrow animals and creatures. About half of the scarecrows are in the Children's Garden, so I was concerned that boys of their ages wouldn't want to go to the "Children's" Garden, but troopers they are! And we had a blast. Kam was climbing dinosaurs and Zach was taking it all in. Of course, I've seen both exhibitions multiple times, but this was a whole new experience. 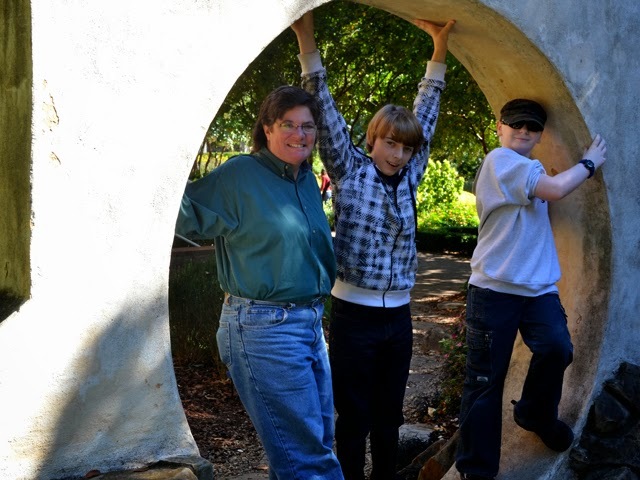 Yes, I'll occasionally have kids and teenagers along when I'm giving a tour in my role as a Garden docent--and I try to engage them as much as possible--but this was a new experience for me. Or at least one I've not had in many years...since my niece and nephew were in middle school! It was a totally AWESOME day! 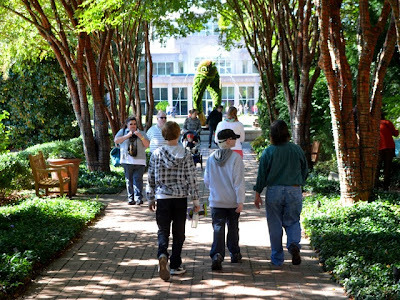 Fortunately, the Atlanta Botanical Garden is never short on programming or new things to see. We talked about all returning this holiday season for Garden Lights, Holiday Nights, which starts in under a month!